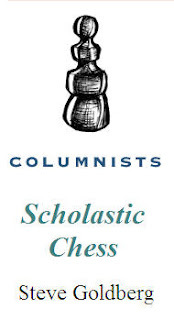 My September Scholastic Chess column is now online at ChessCafe. The 2008 Denker Tournament of Champions ended in a three-way tie for first, and we include a nice game from one of the co-winners. Also, we have reports and games from both U.S. representatives, Tatev Abrahamyan and Tyler Hughes, at the 2008 World Junior Championships in Turkey. The entire column can also be viewed at the ChessCafe archives. 2009 U.S. Championship Coming To St. Louis !!! Be Cautious About b-pawn Advances!